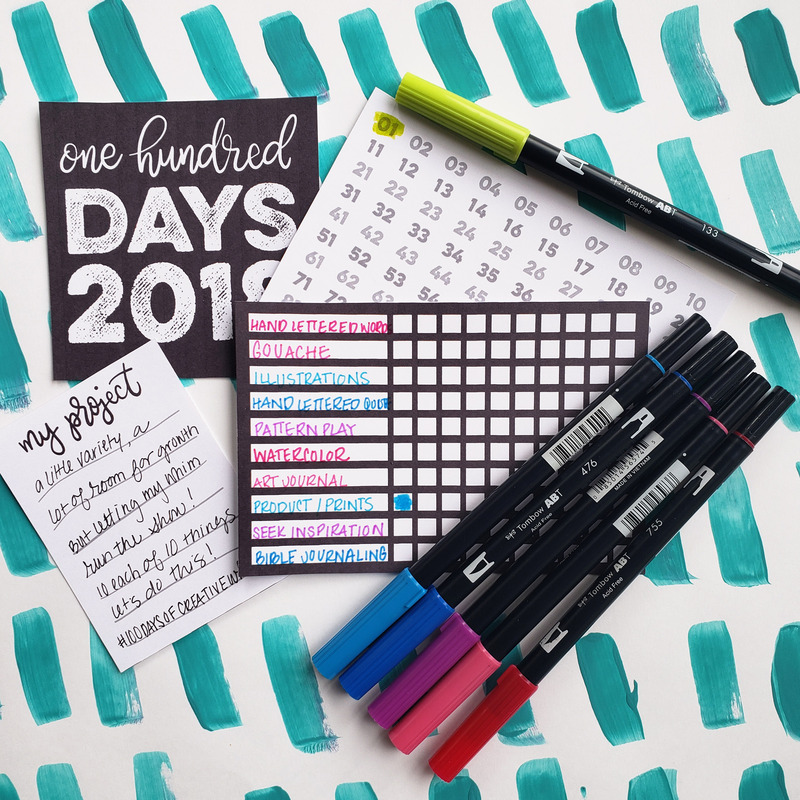 Have you heard of #the100dayproject?? I’m kinda assuming if you are here, that you HAVE because… otherwise how on earth did you find this 😉 But if you haven’t, head over to The100DayProject’s website to read more, and THEN head back over here because I’ve got a little free goodie for you! Ok so, before I share, let me share 😉 So to me, the 100 Day Project Pretty much represents all the things I believe in deep down in my core, both as a creative boss lady, and as a just human person… and that would be this: We ALL have something amazing to share with the world. If we can be brave about stepping out and trying new things, about practicing and learning and growing, there is just SO MUCH to be gained by simply giving yourself permission to GO FOR IT. It is a gift you give yourself, committing to practice and growth. Beyond that, there is something HUGELY empowering about putting your work out there. Nothing is more motivating when things get tough than the cheers of friends to urge you along. There is also something to be said for creating a thing, and then OWNING IT by sharing it with the world and stamping your own little “I did that” on it with a social media post. Seriously… this project is all about the things I love. I’m so excited it exists, I’m so excited to participate, and I SO excited to follow along with those of you that choose to be brave and go for it too! Creativity, community, commitment – it is a beautiful thing friends!!! Last year I did #100daysofwatercolor and I am not overexaggerating when I say it was kinda life changing for me… Although I didn’t get all 100 days in, I certainly grew in skill and habit and boldness and sharing them every day was like… SO stinking incredible. This year I hope to get more work in, more days done, and I’m giving myself a little more flexibility to improve my opportunity for success. (If you are interested in seeing some of my watercolor art from last year check out my hashtag: #Shawnas100Days and the more universal hashtag #100daysofWatercolor for more inspiration). Enough about me though, what I really want to do with this post, is to share with you something for documenting YOUR journey this year! Because my idea got complicated I knew I needed a tracker, and then it occurred to me, who doesn’t need a tracker!? So it turned into a little set of things! 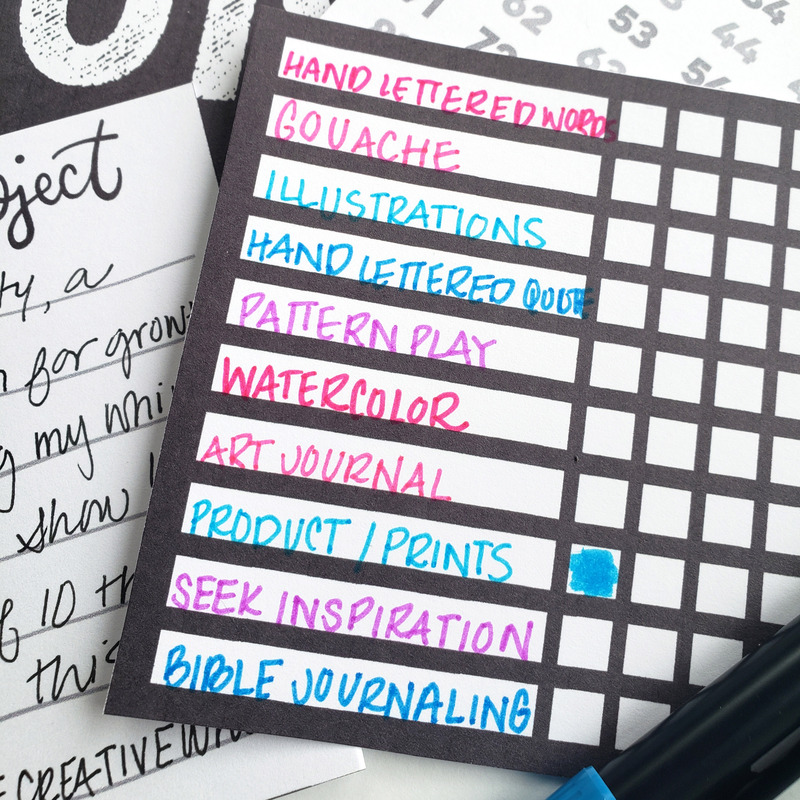 Also, as you can see above, one of my ten categories is “printables & products” so this is officially day number 1!!! Since I’m so passionate about this project, and I want nothing more than to see you get involved, I just HAD to give this away for free! Download and print, it is just simple black and white so it will work for anyone and any project! I don’t ask that you do anything to get this freebie, but if you like what you see and you want to help me spread the love of creativity and others I’d LOVE it if you would tag some friends on my post on Instagramtagram HERE, or if you would share this post – and then follow me over on Instagram & Facebook for LOADS of inspiration and pep talks… Creativity, connection, heart and art! That’s what we’re doing over on social media! HERE is the LINK to the zip with JPG files and the Printable PDF!! And just in case you ended up here from some other place, here is where you can find me on Facebook, and on Instagram!! That’s it friends! Happy 100 Days to each of you! I truly hope you embrace the idea and give it a try – it does NOT have to be perfect, it does not mean you are set in stone for 1/3 of your year and that there isn’t room to change, you don’t have to wait for the “perfect idea” the “perfect time” and you certainly don’t have to wait until you are more artistic/committed/amazing/creative… NO. You just have to say, “Hey! I think I’ll give it a try!” and THEN, all you have to do today, is day 1. Let tomorrow take care of tomorrow, let missed days be a thing that is ok, let each step happen when it is ready. Oh… and most of all, have a little fun!